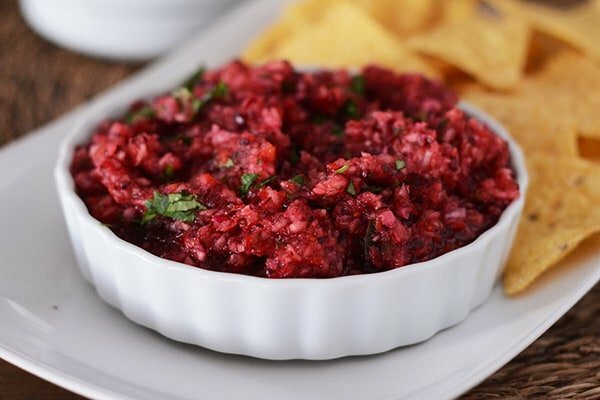 This cranberry salsa will make you feel like a celebrity. At least it did for Brian. He brought it to several events last week and every time, he returned with accounts of people mobbing him for the recipe, weeping at the fear he wouldn’t share it and kissing his feet when he did (accounts may have been ever so slightly dramatized). It is probably the yummiest, simplest thing you can make this holiday season eliciting the same type of reaction that might happen if you made a life sized Santa caricature out of cheesecake and chocolate (can we all commit to each other just not to go there, ever?). People go crazy over this stuff. And it couldn’t be easier: toss everything in a blender or food processor and chop choppity chop. You could also get wild and crazy and serve it at Thanksgiving instead of a more traditional cranberry sauce. Don’t let the fresh cranberry season get away from you without making this. I won’t tell if you decide to make it and keep it all to yourself. Three Years Ago: Top 10 Recipes for Turkey Leftovers! Combine all the ingredients in a food processor or blender and pulse until combined (and it is the texture you want). Refrigerate for at least 2 hours to give the flavors a chance to meld. It can be made and refrigerated for up to a week or longer. If your blender or food processor is on the small side and doesn't chop up large batches of ingredients very well, consider chopping the ingredients separately or in batches and then combining in a bowl. Everybody wanted this recipe! It was the hit of Thanksgiving and so easy to make. I also like that it can be made ahead of time. I absolutely love this recipe! I just added it my blog! It’s a favorite I’ve served since for years now, and I absolutely love it! Thank you for sharing! Not sure how to upload the photo, but this was absolutely delicious. I took out the red pepper and added 3 jalapeños! I also used 1/4 cup of sugar instead of 3/4. It’s way better and a bit healthier!!! Yummy! I served this with turkey and stuffing taquitos. I mix leftover turkey with leftover stuffing, roll in corn tortillas, brush with oil and bake in the oven. Or you could fry them. Perfect salsa for this new Thanksgiving leftover tradition in our home. I made this for Christmas as a cranberry side because my daughter wanted cranberries and I just couldn’t bring myself to buy a can. However, it didn’t thrill and I probably should have left the jalepenos out. Then I saw your post where you put cranberries over cream cheese. I nuked a block and spread it on the plate and lathered on the salsa. Now I have my appetizer to take to New Years Eve. Delicious! This salsa is my absolute favourite when cranberries become in season. I discovered it a couple years ago and now make it every time fresh cranberries hit the grocery store. I follow the recipe exactly; the only thing is that I’ve tried it both with the recommended amount of sugar and with less sugar, and I prefer it with a bit less sugar. We really like tart taste so less sugar works for us! I also make sure to put all the seeds from the jalapeno to give it good kick! Thanks for this absolutely awesome and innovative recipe!!! This is a gorgeous and delicious salsa perfect for Thanksgiving! Wow! Spicy, sweet and tart all in one amazing salsa! We can’t stop eating it!!! I LOVE this recipe. Is it suitable for water bath canning process? I would like to make in advance for holiday gifts, hostess gifts. I’m not sure, Cheryl. I don’t know the exact pH level of the salsa for proper food safety, so I can’t make a recommendation on canning. Sorry! OMG! This is soooo good! Only change I made was to use fresh basil instead of cilantro because it’s what I had on hand. Lunch today (and probably for the next few days) was triscuit crackers with cream cheese and this salsa. It is greater than the sum of its parts. I don’t often take the time to rate recipes but this one is worth it. Try it. You won’t be disappointed! in Bedminster, NJ last night. Not a drop left and there was a lot of food. Received many compliments. Thx for sharing!! Happy Holidays!! By “red pepper” do you mean a red bell pepper?? I have some frozen cranberries in the freezer. Do you think this recipe would work if i thawed the cranberries out and used them? I think it stands a decent chance of working as long as you try to rid the cranberries of excess moisture. 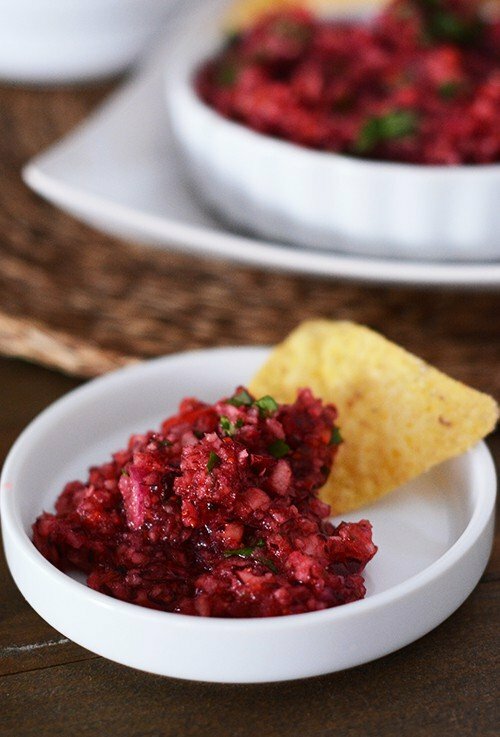 The cranberry salsa worked out well with the thawed cranberries and this recipe is delicious. It is nice to have a salsa variation and something new to do with cranberries. Our daughter made this last night to go with taco salads. I layered spinach, taco meat mix and a few crushed chips and used the cranberry salsa instead of dressing and it was sooooo good that it has earned a place in our regular rotation! Btw…we didn’t have a jalapeño or the applesauce on hand so made it without and it was just wonderful anyway! Thank you! Your site is now on my radar! We never get fresh cranberries this far south. The come in as kinda semi-dried state, almost soft, looking like unmade beds. How would you go about turning them into this gorgeous salsa? Soak them in hot water for an hour? Or just go ahead with the recipe and forget they’re not fresh? Honestly, I’m not sure this recipe will work out with dried cranberries. If you want to try it, I’d probably suggest the soaking method but again, not sure how the consistency and flavors would play out. Good luck! Just wanted to chime in – this was delicious!! Made it for a party last night and served it over softened cream cheese with crackers. A couple of additions I added: some finely chopped orange peel and a few drops of wild orange and lime essential oils. Turned out fantastic!! Has anyone tried this recipe subbing in parsley for cilantro? I love cilantro but most others in my family do not and am wondering if the parsley will still give it that ‘fresh’ element without the ‘soapy’ taste that apparently cilantro has…? Mel…made this over Thanksgiving holiday and it was AMAZING!!! Everyone loved it! Thank you so much! Can’t wait to make it again!! I made this to take as an appetizer for Thanksgiving. It was wonderful and everyone loved it!! I am making it again tonight for our ladies monthly craft get together tomorrow. I’m sure it will be a big hit. Thanks for a great new and different salsa recipe! OMG! We made this over Thanksgiving but it will be a staple in our fridge from now on! It is the best salsa I have ever had!! I have made this since you first posted it. I buy a bag of cranberries at costsco every time i go there from when they first get them in to when they are all gone. I make it using peppers & cilantro from our garden and freeze it so we have it on hand all year. I have even been known to gift it. Thanks for this great recipe that has become a staple for us! I always skim the comments to see if anyone else had tried these things with honey and wanted to say thank you! To those that part if so I don’t have to wonder. Yum! Here’s to urinary tract health (and deliciousness). We like to try a new recipe every year for Thanksgiving, just to shake up the traditionalists a little! This year I made the cranberry salsa and everyone loved it! I plan to use it liberally throughout December, as long as I can get fresh cranberries. Thanks!! Made this and LOVED it. Would love to give it as a gift. Do you think it could be canned? Alternau, since it makes more than 2 of us can handle at a time, do you think it would freeze well? You’d have to consult a canning expert on that one – my inclination is to say no but that’s just because canning safely is a delicate balance of enough acidity for water bath canning otherwise it needs to be pressure canned. Try googling “canning cranberry salsa recipes” and see what turns up. And yes, I do think it would freeze well. Brought this to the in-laws’ for Thanksgiving and we couldn’t stop snacking on it! We ate it with tortilla chips but my mother-in-law tried it on quite a few different crackers and even some veggies! I only have a mini food-processor so I just diced everything by hand. The only thing I did process was the cranberries, in batches. I did not add the jalapeno seeds but I kinda wish I had; a little “kick” would have made it even better. I used bottled lime juice and I reduced the onion by about half, and that was perfect for us. I’ll be making this again soon! Made this for my husbands side of the family on Thanksgiving. Big hit. His bachelor uncle kept hinting that he would like some to take home and just eat it with a spoon. My son asked me to make another batch that he can take back to his dorm room on Sunday. He wants to share it with a young lady he’s been spending a lot of time with. That’s a ringing endorsement to me! After seeing a few very similar recipes online, I made this for one of our Thanksgiving appetizers. Silly me thought that 2 jalapenos (leaving the seeds in one) would be more up our alley, since we love spice and live in AZ. I think I must’ve used the spiciest jalapeno ever, because the whole bowl was flaming-hot-spicy. I didn’t want to throw it out, so I decided to pulse in about 3/4 of a can of crushed pineapple to temper the heat. It turned out amazing! It was an absolute hit, and everyone was hovering over it snatching more. Just thought I’d share in case someone else overdoes the spice-factor. A friend of mine brought this salsa to a Thanksgiving get-together for a couple families. It was OUTSTANDING! I couldn’t get enough and had to find out where she got the recipe! She sent me here to your great site! Thanks! Yay, Deb! So glad you found your way here! Thank you so much for this recipe! It is amazing and a HUGE hit as a Thanksgiving appetizer and as a complement to the turkey. We all ended up skipping the cranberry sauce and eating our turkey with this instead. It will be a Thanksgiving staple for us from here on out. Mmmmm! This was a hit at our family Thanksgiving pre meal (while waiting for the people and food to arrive/finish cooking) Thanks Aunt Marilyn! It is a winner! Will be made again next year! Oh, and it’s not too spicy if you take out the seeds! Even my sister (who doesn’t like spicy stuff) enjoyed it! Wow this sounds super yummy. I bet it would be excellent on some leftover turkey tacos!!! Thanks for a great idea. For those who don’t eat refined sugar and/or don’t have applesauce on hand, 1/3-1/2 cup honey worked beautifully in this recipe! Thanks Trish! I was wondering. I made this salsa over the weekend and it was a hit! I left out the jalapeno since most of my family does not like any ‘kick’ but it turned out that even with the red pepper it had like zero kick and was more sweet than anything. It also turned out that the people who liked the salsa were the same people who would have liked a little kick, so jalapeno next time is in! I chopped the ingredients to about a quarter inch before putting them into the food processor and that worked well. I will go lighter on the cilantro next time (but that’s just because I’ve never been a big fan of it). Overall it went over great, was super super easy to make and I think I’ll be keeping the recipe for next year’s cranberry season! I made this today and it is as good as advertised! Also, I’m travelling in my motorhome…forgot my mini-prep chopper so I chopped with a knife…not as quick, but it worked. I made 1/2 recipe for just me and had to stop myself from just eating it all. Thanks, Mel and all who contributed to this recipe!! 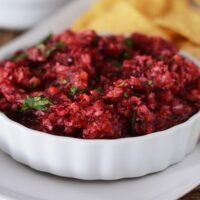 I’ve made your “other” cranberry dip for years now and family and friends ALWAYS ask me for the recipe. Do you like this one better? I see it uses red onion and apple instead of the green onion…just wondering if I should venture out? Love everything I’ve ever tried from your site. If I remember correctly, a friend of mine pours cranberry salsa over room temp cream cheese, and serves it as a spread with crackers. It is fabulous! Would this be good smeared on bread with turkey & spinach? That would be delicious, Karen! Yum! This looks scrumptious, and is definitely a “must make immediately” recipe! Wow, this looks good! What a great twist on salsa. Definitely going to try it! I’ve had a secret longing to find a tasty cranberry recipe for years (traditional cranberry sauce is NOT tasty – sort of like eating green apple skins with syrup – and they are too watery to use in fruit smoothies). Cranberries and cilantro?! I can totally see this texture combo working. Ingenious, Mel! Would this be good to have with your turkey at thanksgiving or just for chips? This would be delicious as a Thanksgiving side dish! Is that 14 cups of cilantro or 1/4 cup cilantro? Nope, not 14 cups! 🙂 Sorry about that. I just fixed it. Hey Andrea – this has a bunch of different flavor profiles, sweet, slightly spicy (depending on if you use the jalapeño seeds or not) and tart, too. Thanks for the report back! Happy to hear it was a success! Oh yummy! Thank you for sharing what sounds like an awesome salsa. I and my family just love your recipes Mel. You’re my virtual cook book. I am assuming the recipe calls for 1/4 C cilantro, not 14 C!!! Can’t wait to try this, looks so good. Yes, it’s just 1/4 cup. This is the swank-ified version of your cranberry jalapeno dip, right? I just love recipes that make people cry. Nothing is finer than food that brings your audience to tears.